Brayden Tucker wears black low cut Converse “Chuck Taylor” All Stars in the film. Lyle works hard to befriend wheelchair-bound David. Different Drummers takes us back in time to Spokane, Washington in the mid 1960s. 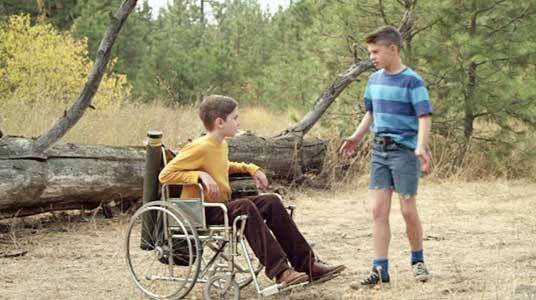 The film opens with a partial view of one of the film’s climactic scenes, where eleven-year-old Lyle Hatcher (Brayden Tucker) is taking his friend and schoolmate, wheelchair bound David Dahlke (Ethan McKay), up a steep hilly street so that they can coast down it. But unfortunately, just after they start down the hill, a large delivery van turns and begins to head up the hill right in their pathway. This is something that the boys impulsively did during a break on a school field trip, so all of their classmates and teachers see what happens. We are not shown the ending of the scene until much later, but it serves as an introduction to the two boys and the unpredictable nature of Lyle. The story then backtracks again to its start where we learn more about the two boys. Lyle is naturally a hyper kid, who was described at the time as having Minimal Brain Dysfunction, something that today would be considered ADD, Attention Deficit Disorder. At the same time he has an outgoing personality, is intellectually aware, and wants to help others, especially David, who suffers from muscular dystrophy. Although David has special needs and is slowing down due to the onslaught of his disease, Lyle realized that David is one of the smartest kids in his class, and Lyle wants David to be his partner on their upcoming science project. Lyle shows off his black widow spider. As the storyline continues, we see that Lyle is always getting into trouble for acting out in class, or spacing out like when he dreams that he is at an actual prom during dance class, or someone that accidents always seem to happen to. Most of the other students in his class avoid having anything to do with Lyle because of these past accidents, and so no one really wants to work with him on class projects. Luckily for Lyle he is able to strike up a friendship with David and they eventually agree to put together a mighty collection of bugs for their science project. A second facet to the storyline has a religious aspect to it. David is able to predict the death of their fourth grade teacher who is out ill when the film begins. When Lyle hears of this he is amazed, and wants to know how David is able to do this. David tells him that he hears from God inside his head. Lyle decides that if this is true, he can (with God’s help) get David to get out of his wheelchair and run again by having him develop the will to do so, something he overhead on the Jack LaLanne show that his mother always watches. Lyle begins to act like a personal trainer with David, getting him outdoors to help collect bugs for their science project and continually encouraging him to be more active in general. David and Lyle in the woods looking for insects. 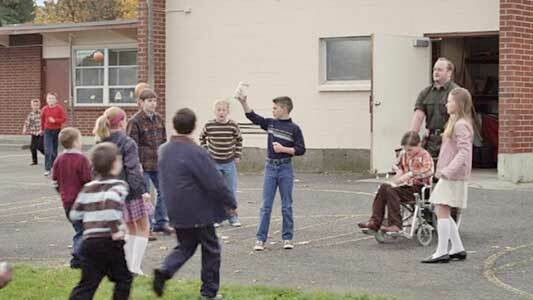 The third aspect of the storyline has to do with the elementary school the boys attend. You see how old-fashioned to our way of thinking that their school is, with the students all expected to answer questions in unison and do everything they are told with unqualified obedience. Miss O’Donnell (Colleen Cary), the principal is especially authoritarian and works hard to control all aspects of Lyle’ behavior, giving him regular discipline like spending recess indoors in the janitor’s room, then later insisting that Lyle be put on Ritalin (or some similar drug), something that is bad for Lyle. After David passes out at school, the drug taking order is ended after Miss O’Donnell is confronted by staff members and even David, who bravely wheelchairs into her office to say how what she has done has turned Lyle into a shell of his real self. When Miss O’Donnell tells a meeting with Lyle and David’s parents that she intends to expel Lyle, David’s parents are adamant that the boys’ friendship is a good thing and that the boy’s friendship shouldn’t be broken up. Ironically, Miss O’Donnell ends up being thwarted by her own obsession with rules and not listening to what her students say. One of the high points of Lyle’s school experience is how he puts together a fund raising challenge at the parents back to school night assembly to raise money for muscular dystrophy research to help David. Something that is cool about Lyle is that he knows how to put a plan together. Through the advice of the school custodian Mr. Merrick (D. A. Anderson), Lyle gets the cooperation of the organizer of parent’s night, the fire department, some drummers, and even a police officer to assist him. This overwhelms Miss O’Donnell’s automatic opposition to whatever Lyle wants to do at the assembly. Lyle is good friends with the school custodian. Different Drummers was put together independently as a tribute to the life of David Dahlke by Lyle Hatcher and Don Caron, so the film is autobiographical and based on true events. Eventually the film deals with David’s passing but does so in a way that is spiritual but not overbearing in its religious theme. The ending of this film also reminds one of the ending to Digger, the film next to this one in our listings. The producers picked a great kid actor to portray young Lyle, and Brayden Tucker and Ethan McKay give quite believable performances. They are especially effective during the scenes when Lyle has been forced to take drugs, as are Lyle’s parents (Lisa Coronado and Damon Mentzer) as they agonize over the decision on whether to administer the drugs to their son. These days we are more aware than ever that there are always people who march to the beat of a different drummer, and that can be a good thing. 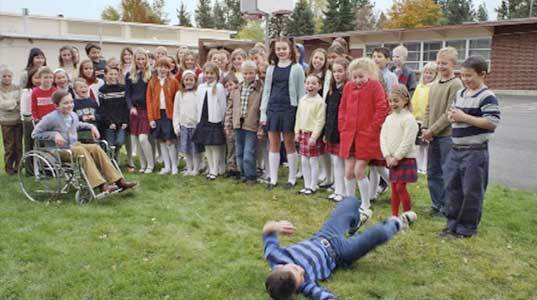 Lyle shows off his tumbling skills to the schoolyard. Lyle gets stuck on the fence while trying to leapfrog it. Brayden Tucker in his role as Lyle wears black low cut chucks throughout the film. Brayden looks very 1960s in his outfits of blue striped shirts, jeans or jeans cutoffs, and his black low cut chucks that he likes to wear with bright blue socks. Brayden explains in the film that most of his clothing is blue because he is color blind and can’t see reds or greens. The camera work is chucks friendly and they appear in all of his scenes. 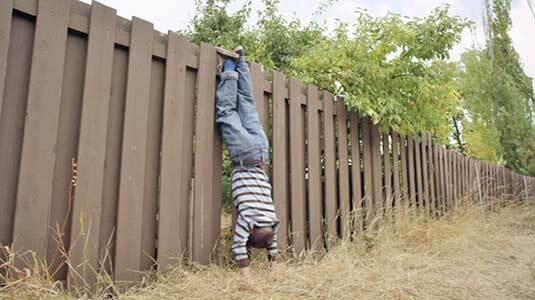 The best scene is when Lyle tries to take a short cut over a neighbor’s tall fence but ends up getting his foot snagged between two of the boards. Luckily his mom is able to free his foot and he can roll down safely to the ground. Lyle’s mom works his foot free. Different Drummers. (2013) Brayden Tucker, Ethan Reed McKay, Colleen Carey, D. R. Anderson, Lisa Coronado. Written and directed by Don Caron and Lyle Hatcher. Categories: Family, Drama.